Applications are now open for talented young sports men and women from across England, Wales and Northern Ireland to apply for a share of a £1 million funding pot, out to help young sporting stars realise their dreams. Talented athletes have until 20th February 2016 to apply for financial awards of up to £1,250. The funding is thanks to the GLL Sport Foundation (GSF), the largest independent athlete support programme in the UK, operated by charitable social enterprise, GLL. The programme works in partnership with sport national governing bodies through the national charity SportsAid to support the next generation of sporting talent. In 2015, GSF supported 1700 athletes across 105 sporting disciplines and with over 90% of award recipients receiving no other centralised funding support the programme is focussed on supporting athletes with the right support at the right time along their sporting journey. With the Rio 2016 Olympic and Paralympic Games just around the corner, the programme is supporting athletes that will look to compete at these games including ambassadors Tom Daley, Dina Asher-Smith, Aled Davies and Lutalo Muhammad. Lutalo, Team GB taekwondo athlete explains the impact the programme has made to his journey “When I first started to compete internationally GSF was my only source of funding and I can sincerely say ‘but for’ them I would not of transitioned from a skinny kid that loved sport to an Olympic medallist”. The programme is equally focussed on athletes that are aiming for the 2020 and 2024 Games and with over 70% of award recipients being aged under 21 the focus is on the next generation of sporting talent. Sally Gunnell OBE, GSF Patron and former concurrent Olympic, World, European and Commonwealth 400m hurdles title holder explains, “From my own experience, starting out as a young athlete and progressing through my sport, I understand how important support from the Foundation is to the realisation of sporting ambitions. Through the programme we are providing the next generation of athletes with tangible support to make a real difference to their sporting journeys”. GSF Chairman, Peter Bundey states, “It is crucial that we support the talent and enthusiasm of our young sporting stars. We can help young athletes bridge the difficult leap from regional to national and international level as they start to become ready for senior competition”. “We are delighted to continue to work in partnership with SportsAid, who provide vital links between us and national governing bodies of sport. Working with SportsAid ensures that our funding becomes part of the national talent development programmes, which is important for all sports and young sporting talent”. SportsAid’s Chief Executive Tim Lawler adds, “Working with the GLL Sport Foundation enables us to help more young athletes and ensure the right people are funded at the right time”. Peter Bundey further highlights the equally core role sponsors and partners play for GSF “I would like to thank our sponsors, local authority and public sector organisations in providing the finances, partnerships and infrastructure to ensure the continued sustainability of the programme that impacts so many athlete lives, GSF is a true partnership programme and we are all committed to positively impact athletes and our wider communities sporting journeys for years to come”. The GSF was launched in 2008 by Sally Gunnell at the House of Commons. Since then, the programme has provided over 8700 athlete awards with support worth over £4.9million. 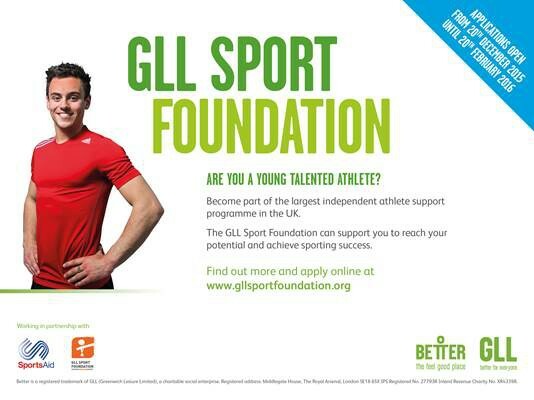 To find out further details of the scheme and apply please go to the GSF website at www.gllsportfoundation.org. Applications for 2016 awards are open until 20th February 2016. Each of the successful applicants will benefit from financial and or training awards. Financial awards of up to £1,250 will support athletes associated travel, competition and equipment costings during the next 12 months. Recipients will also benefit from sports performance support and training awards that allow free sporting access to more than 200 sport and leisure venues managed by GLL and partners across the UK.